Honda Motorcycle & Scooter India aims to add another 1,000 customer touch points in the current fiscal. NEW DELHI: With an eye on expanding its reach in the country, Honda Motorcycle & Scooter India aims to add another 1,000 customer touch points in the current fiscal. The company, which has 25 per cent market share in the country's two-wheeler market, currently has 1,950 sales and service touch points, including dealerships, sub-dealerships and authorised service stations, spread across the nation. "We are expanding the sales network aggressively. 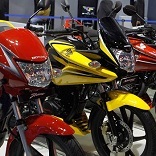 Last fiscal, we added 800 new touch points and this financial year, we are targeting to add another 1,000," Honda Motorcycle & Scooter India (HMSI) Vice-President (Sales & Marketing) Yadvinder S Guleria told . The company has already added around 150 customer touch points, out of the planned 1,000 in the current fiscal, thereby taking the total number to 1,950 across the country, he added. "The further expansion of the sales network will now pick pace as various activities, including paperwork and other formalities, which take time, have now been concluded," Guleria said. He added that the expansion of the sales network would not be limited to some specific states and would cover the entire country. When asked about the expansion plans in rural areas, Guleria said: "We still have to figure out as how many of the 1,000 touch points would come up in the rural areas, though currently, we have around 35-40 per cent of our sales network in rural areas." The company, which has been traditionally strong in urban areas, is now also looking to strengthen its position in the hinterlands. The company has also launched various activities, including a new corporate campaign, which focuses on urban and rural population in equal measure. HMSI, which sells popular models like Activa and CB Shine, sold 37.21 lakh units in 2013-14 and aims to sell 45 lakh units in the current fiscal.